A zombie apocalypse seems a likely possibility these days, and the zombie craze that’s sweeping the nation has infiltrated mobile apps too. 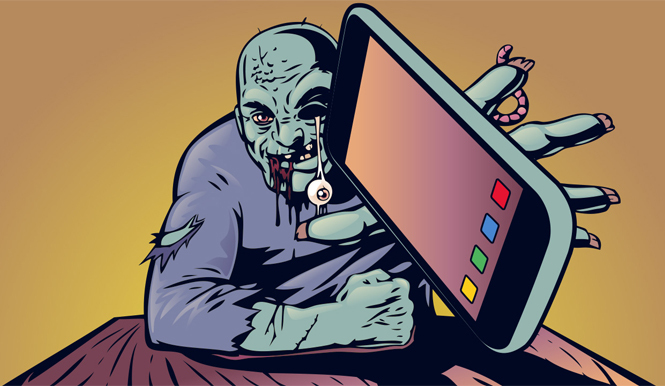 With Halloween just around the corner, I thought it would be fun to see, given the quality and availability of zombie-related mobile apps out there, who would be better prepared to survive a zombie apocalypse: iOS or Android users? It’s probably good to know anything and everything there is to know about zombies before you try taking them on. First step: read up on the subject. There’s a ridiculously large amount of zombie literature out there to help you prepare for any type of impending zombie attack. 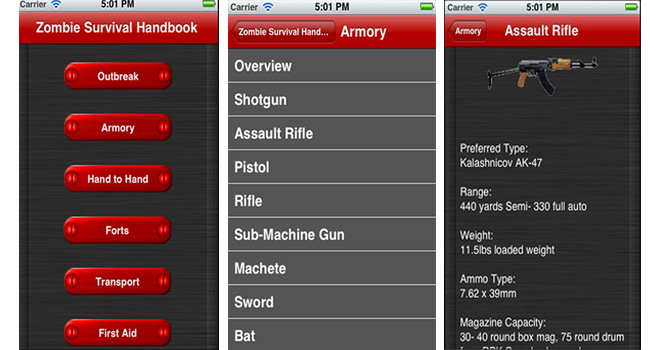 The Zombie Survival Handbook Lite, available for both Android and iOS, is one good source of this kind of information. The apps gives info including reasons for a potential outbreak, the weapons and tools you need to defend yourself, and where to go when the outbreak starts. The full paid-version of the Zombie Survival Handbook has a few extra tips and tricks to help you survive. Even better though, is the Zombie Survival Guide Scanner. 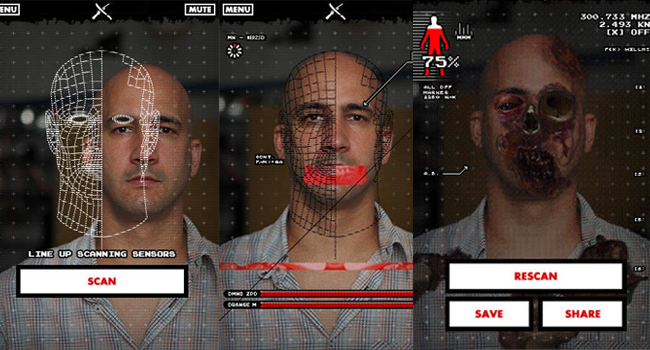 Created by ‘zombieologist’ and author of The Zombie Survival Guide, Max Brooks, the app will scan you and your friend’s photo to see if, and how much, you have been infected. It’s the sure fire way for you to tell who’s still safe, and who to stay away from. Lucky again for both iOS and Android users, as the app is available for both operating systems. Winner: A tie. Both top-notch apps in the category are available to prepare iOS and Android users with everything they need to know about the undead. So, now that you know everything there is to know about zombies, the next step is training for battle. There are a ton of zombie-related mobile games, but some are more realistic than others and would do a much better job at preparing you for a real-life apocalyptic showdown. Contract Killer: Zombies is a perfect practice game for a zombie apocalypse and is available for both both iOS and Android. A massively popular and graphically pleasing game from Glu Games, this first-person shooter is the zombie version of the popular Contract Killer series. As well as shooting zombies, it also lets you help other survivors, gather supplies and build an arsenal of zombie-killing weapons. Contract Killer: Zombies is probably one of the most complete and ‘realistic’ zombie apocalyptic simulators for mobile, if such a thing exists. 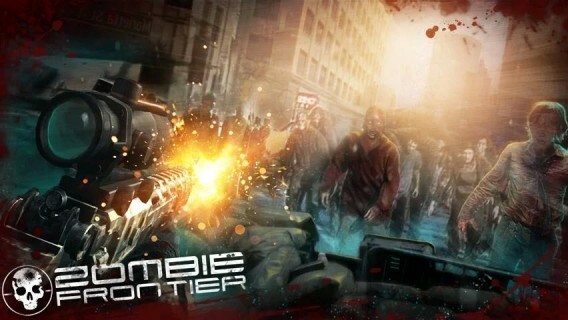 Zombie Frontier is another good option for practicing your zombie shooting skills. It’s a basic shooter game where you, the survivor of a serious worldwide T virus infection, must battle the infected who have turned into, what else, zombies. Zombie Frontier is only available for Android, meaning unlucky iPhone users won’t be able to join in on shooting practice. Zombie Highway is good if you need to practice your escape. 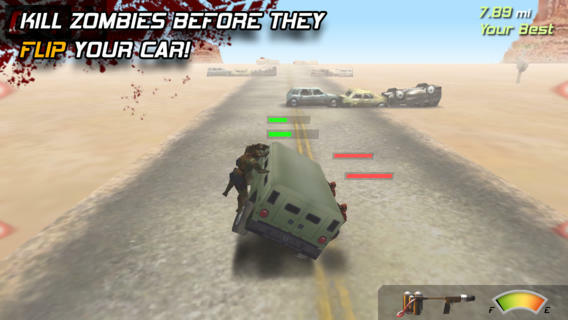 It’s a driving game where zombies try to prevent you leaving by hanging onto your car. You lose them by swerving and knocking them off or shooting at them through the window. If you plan to run and not hide, this game for iOS and Android is a good training mechanism. Winner: Android. Zombie Frontier is massively popular and could give Android users that extra bit of zombie shooting experience they need to get ahead. If you can’t beat ’em, join ’em! Blending in is key, and it could be your last chance of escaping the wrath of the undead. Zombie Booth is one of the most popular apps for zombify-ing yourself: choose a photo and add blood, guts and gore to make yourself hideously terrifying and a dead ringer for one of the zombie hoards. 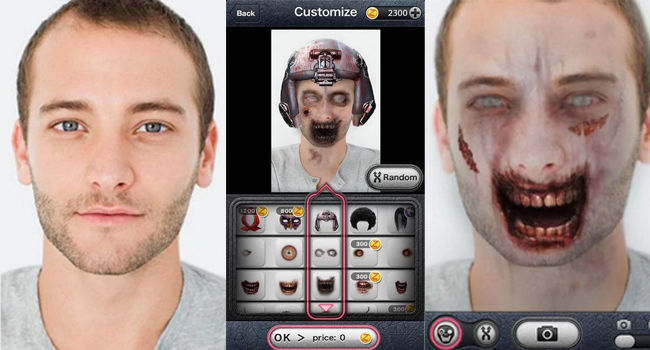 Zombie Booth even lets you create 3-D images, turning your 2-D photo into a breathing, growling 3-D zombie. Luckily for all users, Zombie Booth is available for both iOS and Android. A similar app comes from the massively popular AMC series The Walking Dead. The Walking Dead: Dead Yourself lets you add zombie eyes, mouth and props to turn you into a realistic-looking zombie, at least in photographic form. 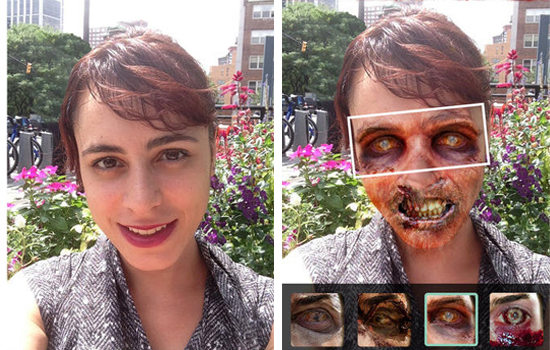 Again, this key zombie-transformation app is available for both iOS and Android. The winner: A tie. The most convincingly transformative apps are available for both users. It looks like both Android and iOS users have the apps to properly equip themselves in case of a zombie apocalypse. Android users may have a slight edge with Zombie Frontier, but its still too close to call. Who do YOU think is more likely to survive a zombie apocalypse?